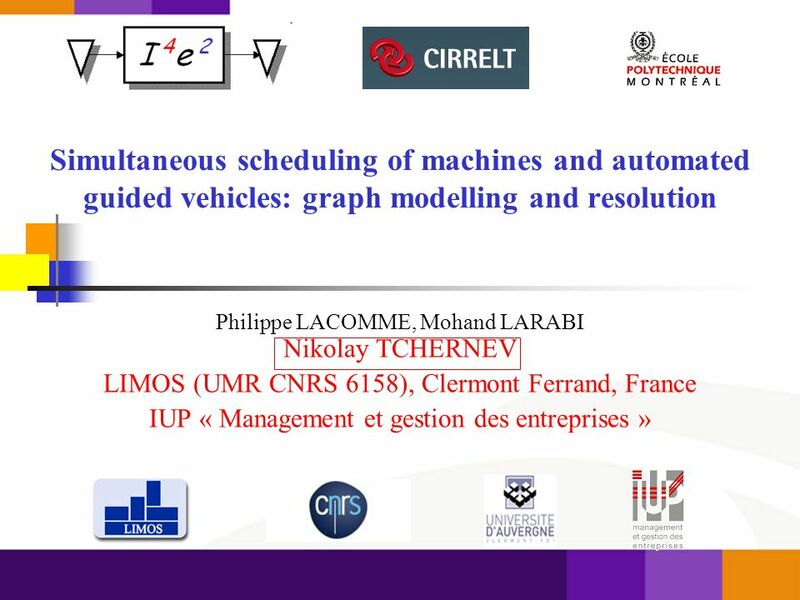 Simultaneous scheduling of machines and automated guided vehicles: graph modelling and resolution Philippe LACOMME, Mohand LARABI Nikolay TCHERNEV LIMOS. 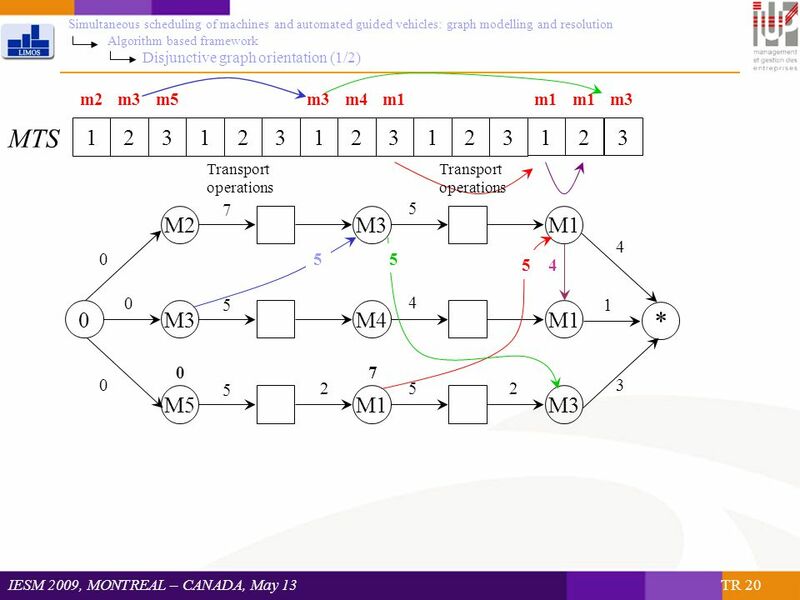 9 IESM 2009, MONTREAL – CANADA, May 13 TR 9 Simultaneous scheduling of machines and automated guided vehicles: graph modelling and resolution Introduction AGV operating (2/2) There are two types of vehicle trips:  the first type of loaded vehicle trips ;  the second one is the empty vehicle trips. 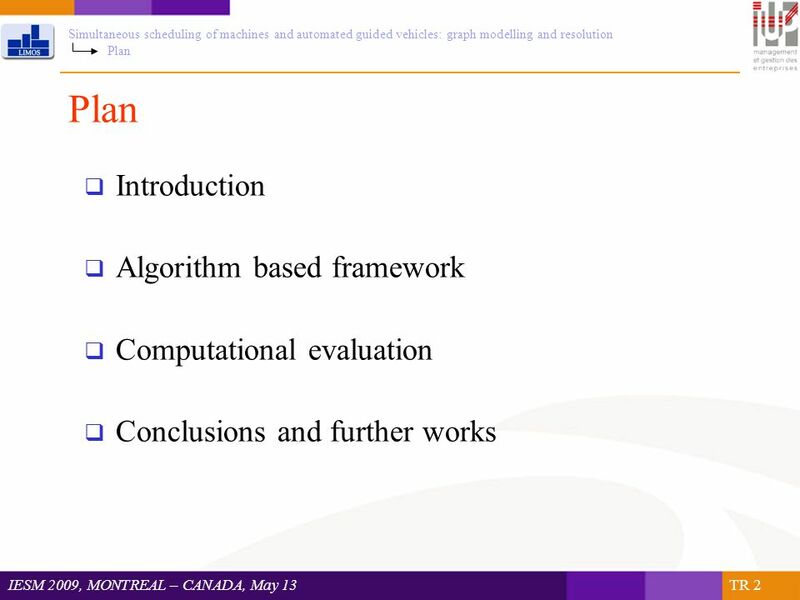 10 IESM 2009, MONTREAL – CANADA, May 13 TR 10 Simultaneous scheduling of machines and automated guided vehicles: graph modelling and resolution Introduction Problem definition (1/5) Problem definition The scheduling problem under study can be defined in the following general form: Given a particular FMS with several vehicles and a set of jobs, the objective is to determine the starting and completion times of operations for each job on each machine and the vehicle trips between machines according to makespan or mean completion time minimization. 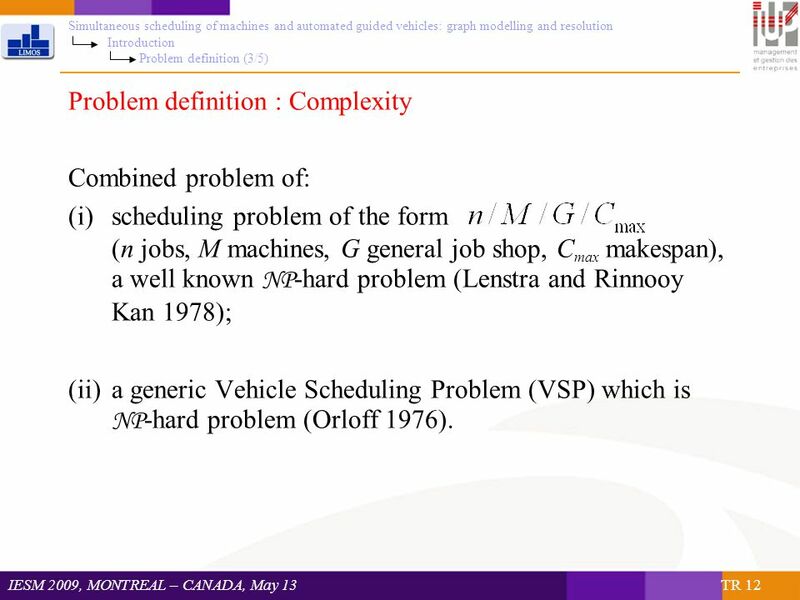 12 IESM 2009, MONTREAL – CANADA, May 13 TR 12 Simultaneous scheduling of machines and automated guided vehicles: graph modelling and resolution Introduction Problem definition (3/5) Problem definition : Complexity Combined problem of: (i)scheduling problem of the form (n jobs, M machines, G general job shop, C max makespan), a well known NP -hard problem (Lenstra and Rinnooy Kan 1978); (ii)a generic Vehicle Scheduling Problem (VSP) which is NP -hard problem (Orloff 1976). 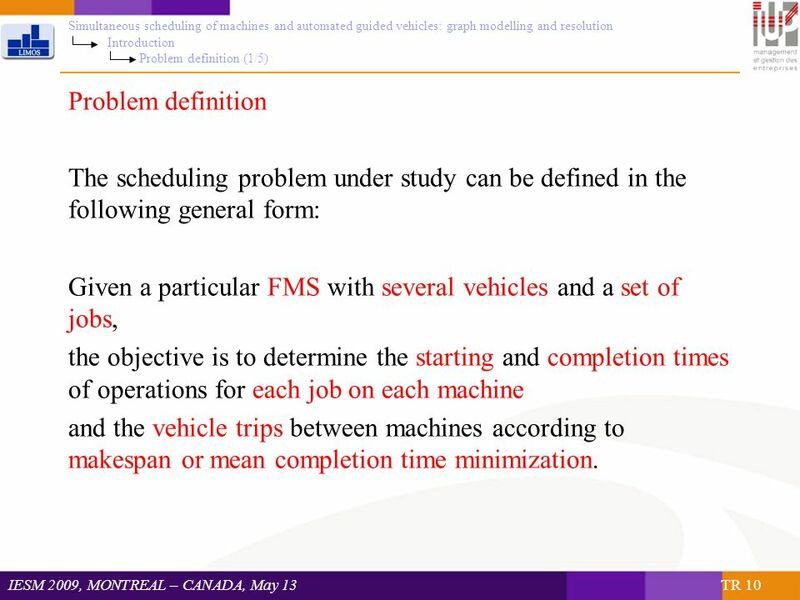 13 IESM 2009, MONTREAL – CANADA, May 13 TR 13 Simultaneous scheduling of machines and automated guided vehicles: graph modelling and resolution Introduction Problem definition (4/5) Problem definition : Assumptions in the literature  All jobs are assumed to be available at the beginning of the scheduling period.  The routing of each job types is available before making scheduling decisions. 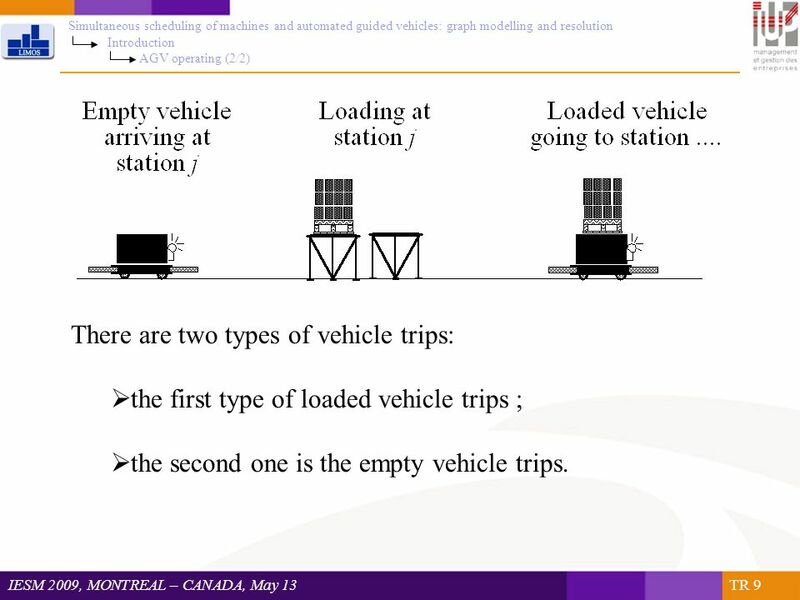  All jobs enter and leave the system through the load and unload stations. 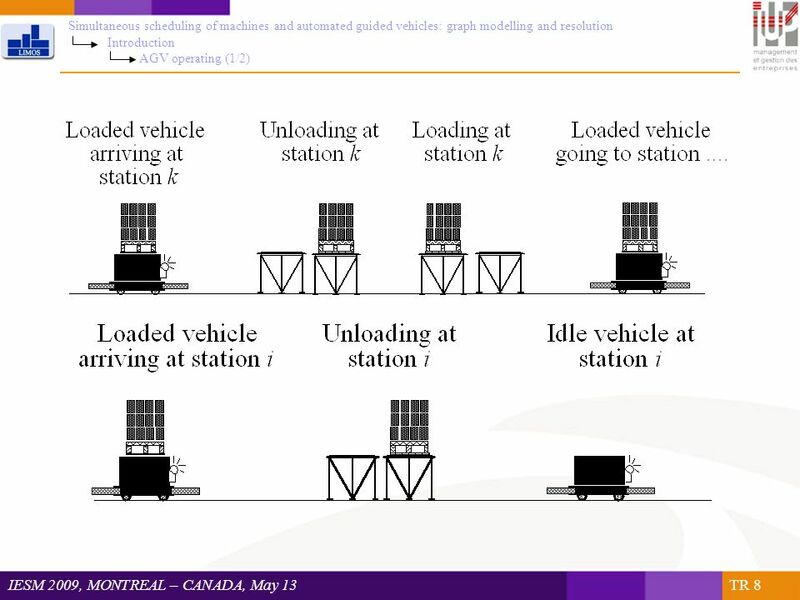  It is assumed that there is sufficient input/output buffer space at each machine and at the load/unload stations, i.e. the limited buffer capacity is not considered. 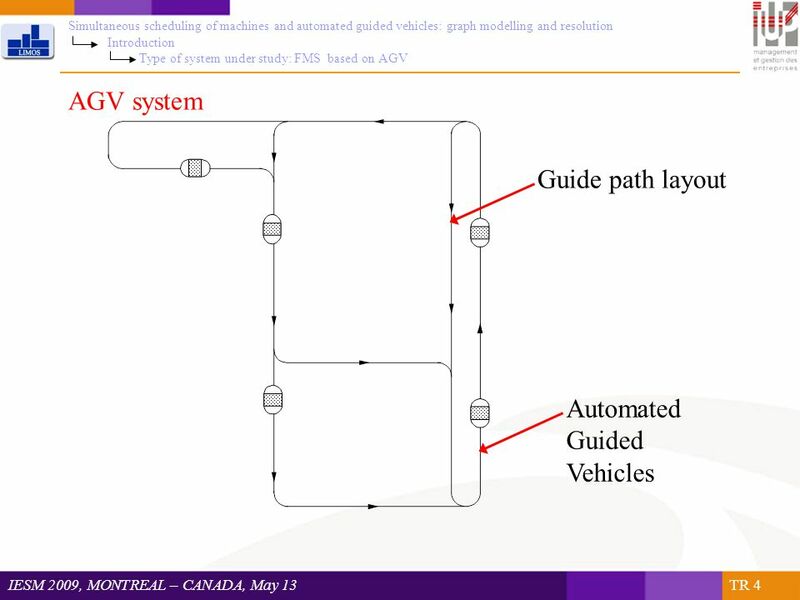  Vehicles move along predetermined shortest paths, with the assumption of no delay due to the congestion. 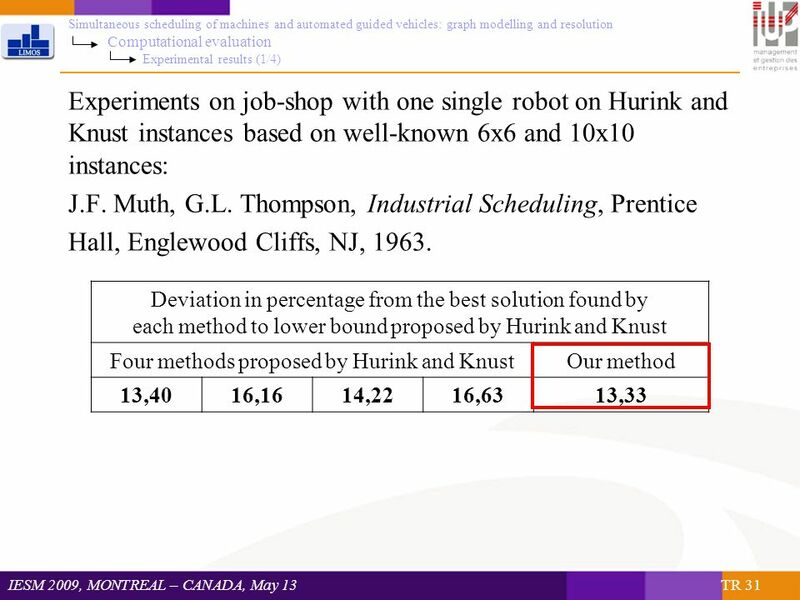  Machine failures are ignored. 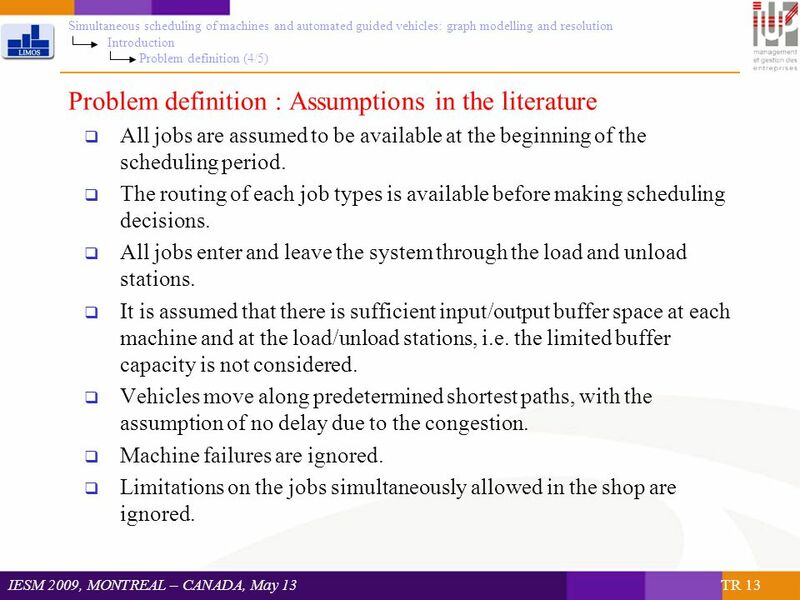  Limitations on the jobs simultaneously allowed in the shop are ignored. 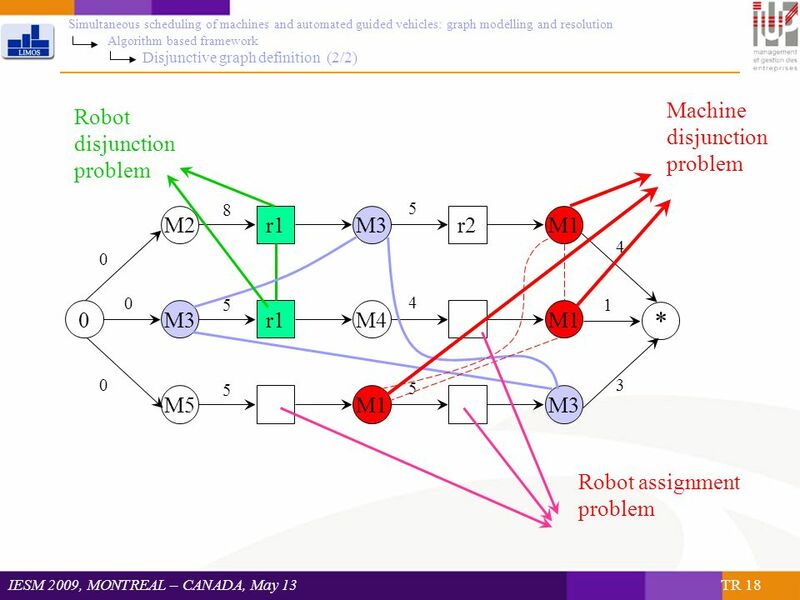 14 IESM 2009, MONTREAL – CANADA, May 13 TR 14 Simultaneous scheduling of machines and automated guided vehicles: graph modelling and resolution Introduction Problem definition (5/5) Under these hypotheses the problem can be without doubt modelled as a job shop with several transport robots. 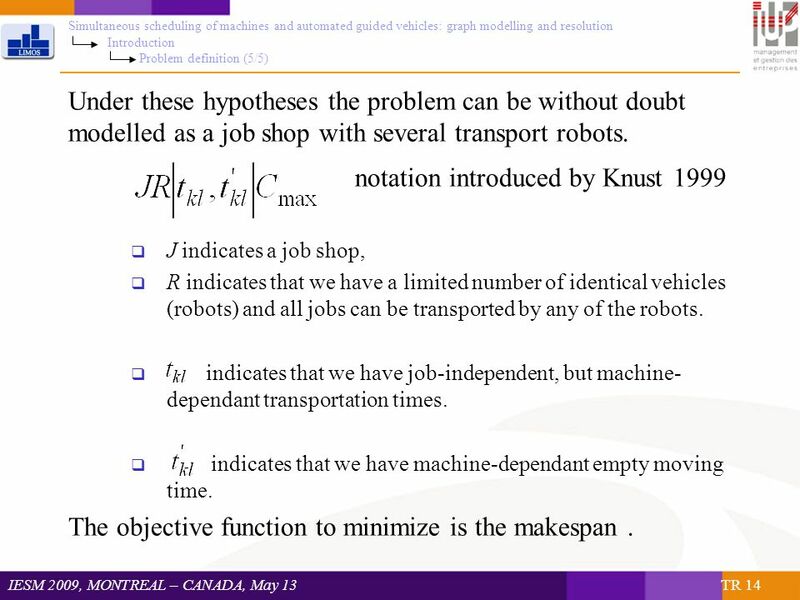 notation introduced by Knust 1999  J indicates a job shop,  R indicates that we have a limited number of identical vehicles (robots) and all jobs can be transported by any of the robots. 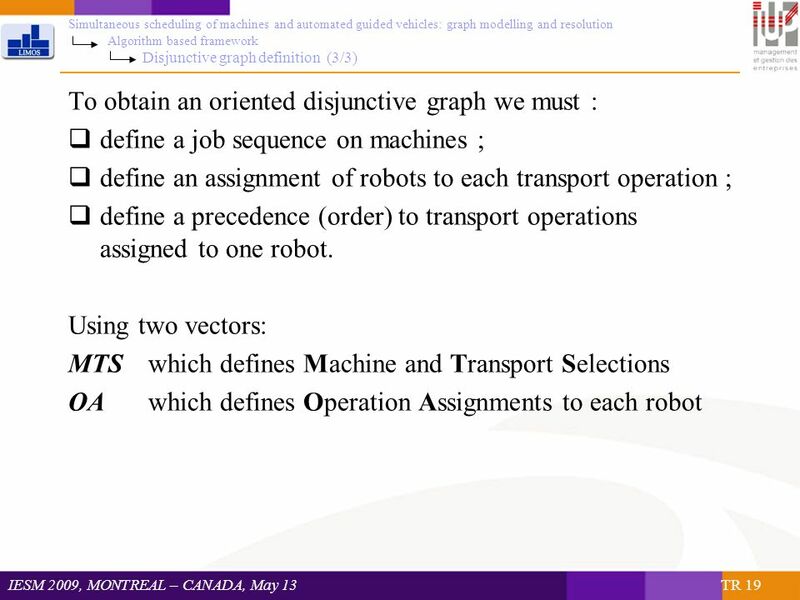  indicates that we have job-independent, but machine- dependant transportation times.  indicates that we have machine-dependant empty moving time. 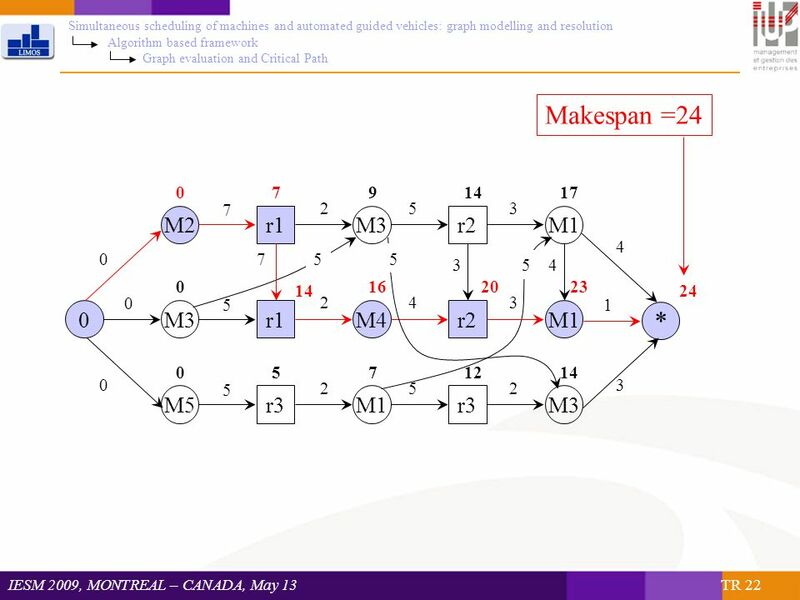 The objective function to minimize is the makespan. 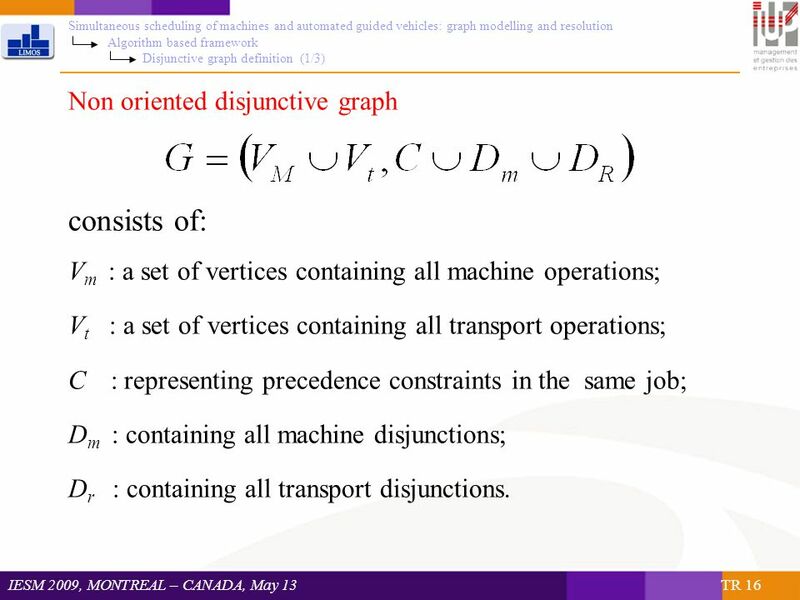 16 IESM 2009, MONTREAL – CANADA, May 13 TR 16 Simultaneous scheduling of machines and automated guided vehicles: graph modelling and resolution Algorithm based framework Disjunctive graph definition (1/3) Non oriented disjunctive graph consists of: V m : a set of vertices containing all machine operations; V t : a set of vertices containing all transport operations; C : representing precedence constraints in the same job; D m : containing all machine disjunctions; D r : containing all transport disjunctions. 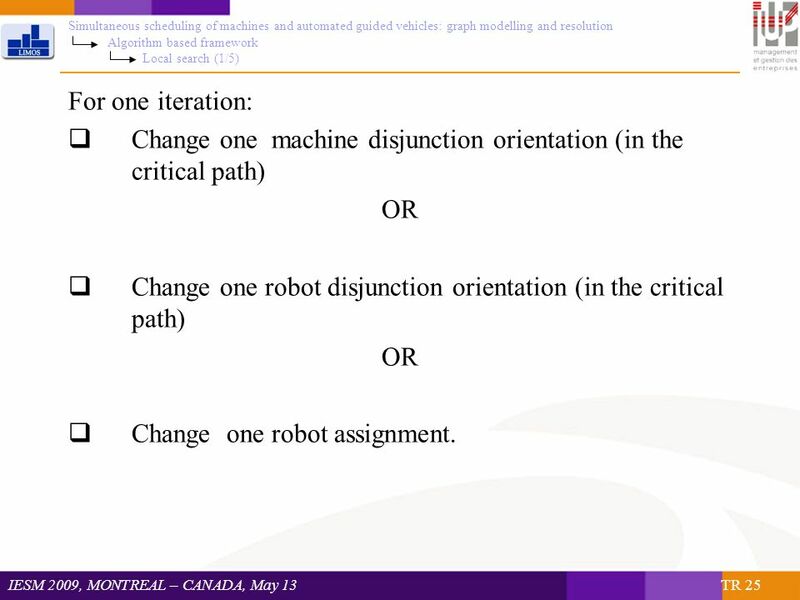 25 IESM 2009, MONTREAL – CANADA, May 13 TR 25 Simultaneous scheduling of machines and automated guided vehicles: graph modelling and resolution Algorithm based framework Local search (1/5) For one iteration:  Change one machine disjunction orientation (in the critical path) OR  Change one robot disjunction orientation (in the critical path) OR  Change one robot assignment. 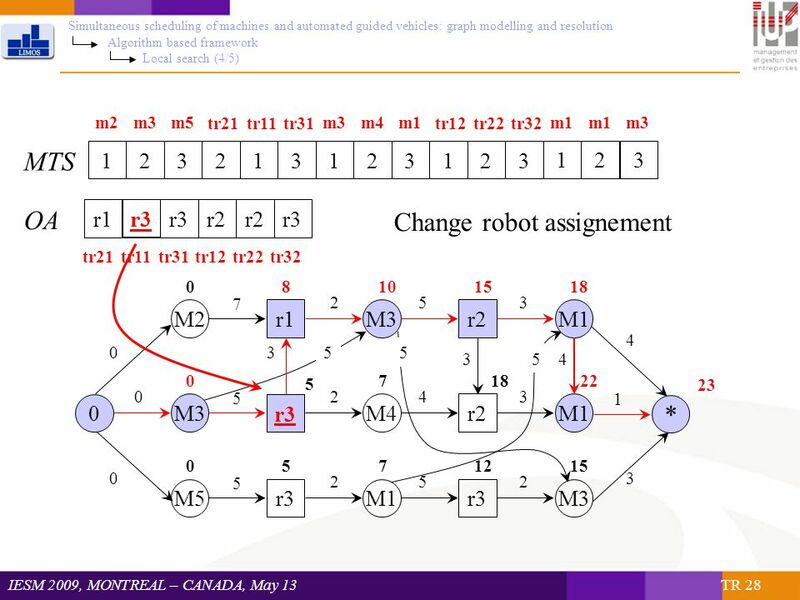 30 IESM 2009, MONTREAL – CANADA, May 13 TR 30 Simultaneous scheduling of machines and automated guided vehicles: graph modelling and resolution Computational evaluation Instances Two types of experiments have been done using well known benchmarks in the literatures. 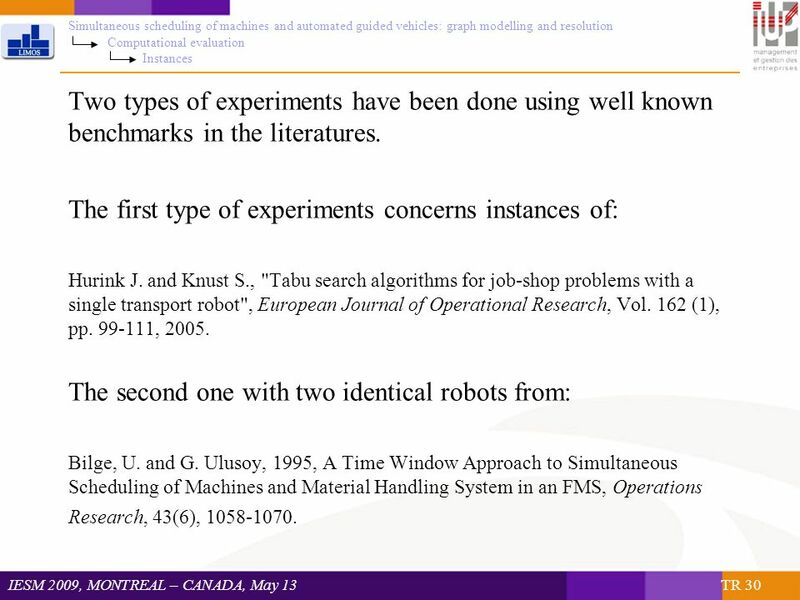 The first type of experiments concerns instances of: Hurink J. and Knust S., "Tabu search algorithms for job-shop problems with a single transport robot", European Journal of Operational Research, Vol. 162 (1), pp. 99-111, 2005. 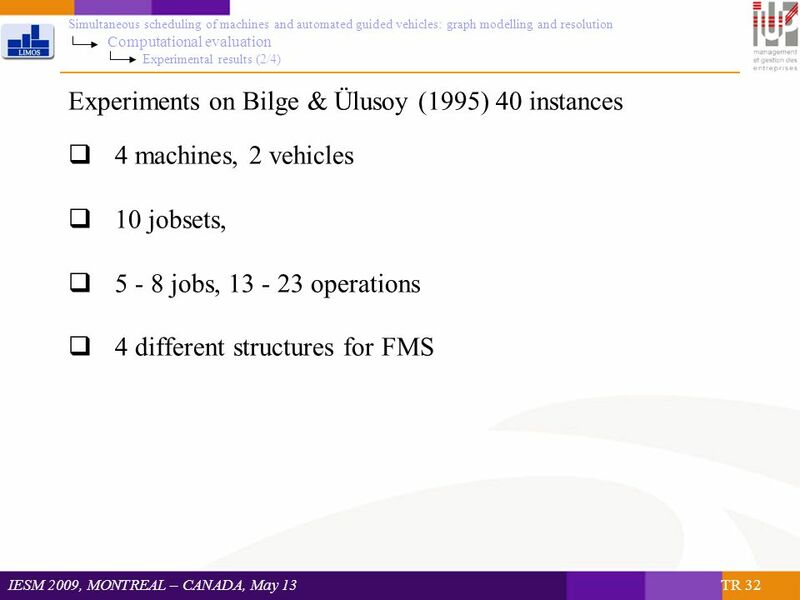 The second one with two identical robots from: Bilge, U. and G. Ulusoy, 1995, A Time Window Approach to Simultaneous Scheduling of Machines and Material Handling System in an FMS, Operations Research, 43(6), 1058-1070. 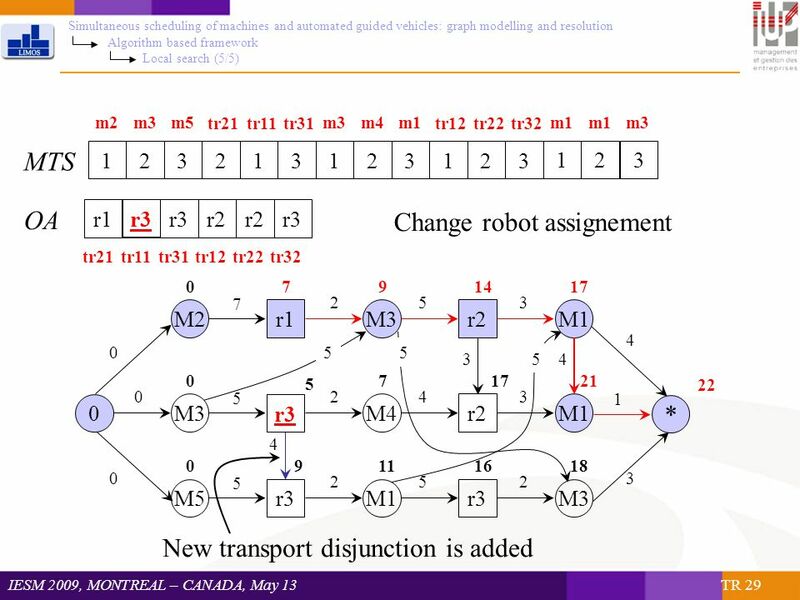 Download ppt "Simultaneous scheduling of machines and automated guided vehicles: graph modelling and resolution Philippe LACOMME, Mohand LARABI Nikolay TCHERNEV LIMOS." FLOW SHOPS: F2||Cmax. 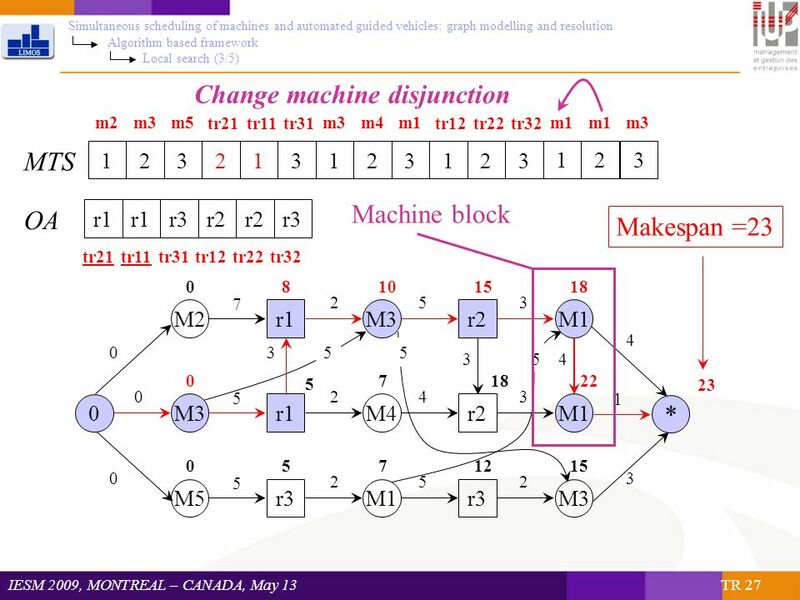 FLOW SHOPS: JOHNSON'S RULE2 FLOW SHOP SCHEDULING (n JOBS, m MACHINES) n JOBS BANK OF m MACHINES (SERIES) n M1 M2Mm. Yazid Mati & Xiaolan Xie CRF Club, 04/07/2004 Scheduling Automated Manufacturing Systems with Transportation and Storage Constraints Yazid MATI Ecole des. 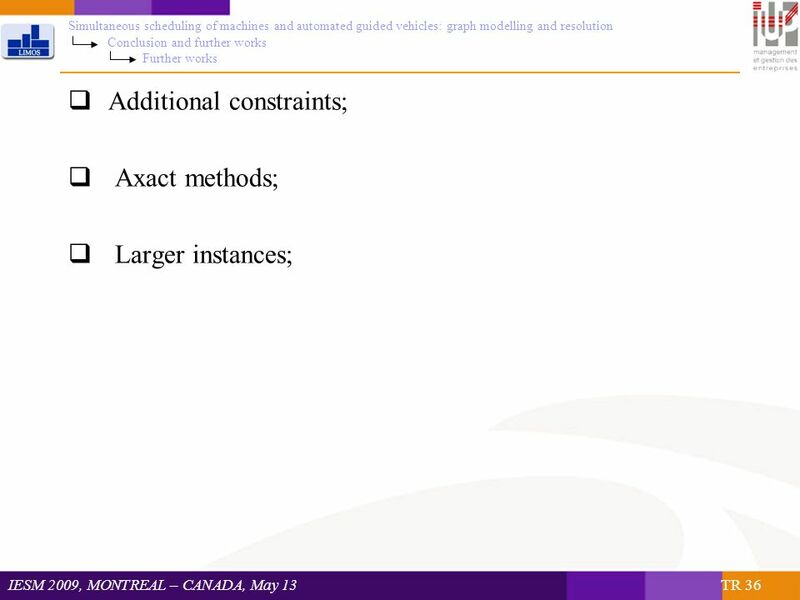 GRAPH BALANCING. 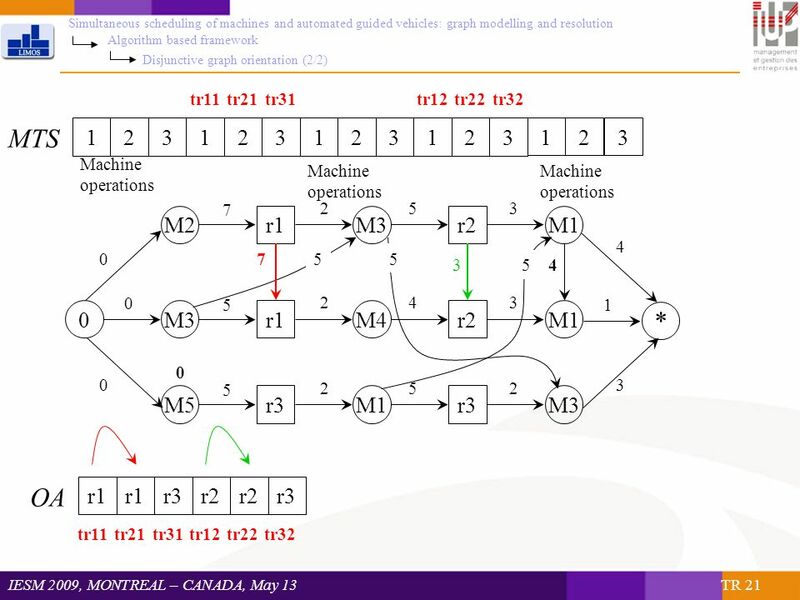 Scheduling on Unrelated Machines J1 J2 J3 J4 J5 M1 M2 M3. Motion Planning for Point Robots CS 659 Kris Hauser. 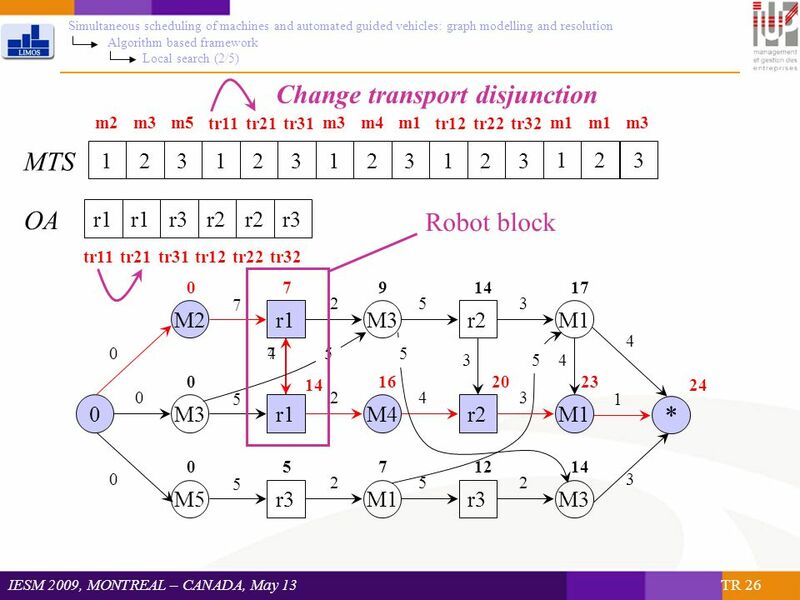 1 EE5900 Advanced Embedded System For Smart Infrastructure Static Scheduling. 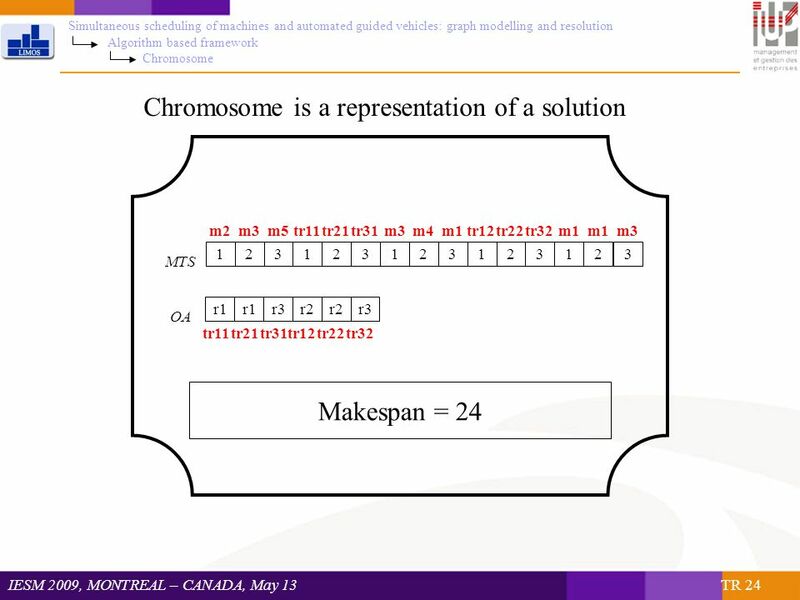 Solutions for Scheduling Assays. Why do we use laboratory automation? 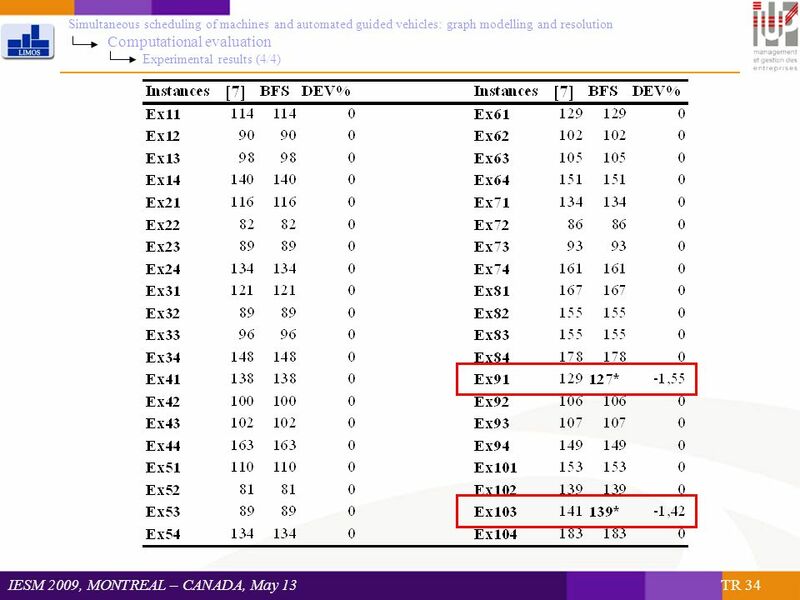 Improve quality control (QC) Free resources Reduce sa fety risks Automatic data. 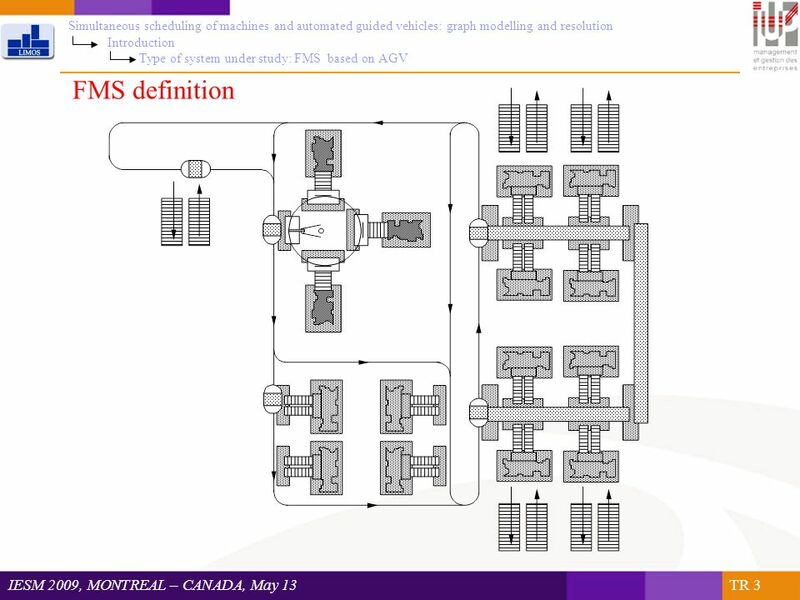 MODELING AND ANALYSIS OF MANUFACTURING SYSTEMS Session 13 MATERIAL HANDLING SYSTEMS E. Gutierrez-Miravete Spring 2001. Ant Colony Optimization. Brief introduction to ACO Ant colony optimization = ACO. Ants are capable of remarkably efficient discovery of short paths during. 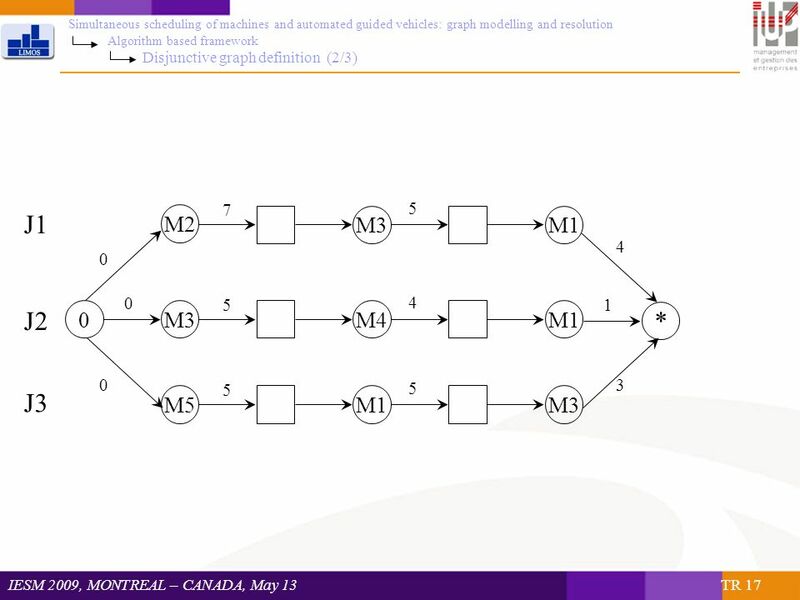 Characterizing the Distribution of Low- Makespan Schedules in the Job Shop Scheduling Problem Matthew J. Streeter Stephen F. Smith Carnegie Mellon University. 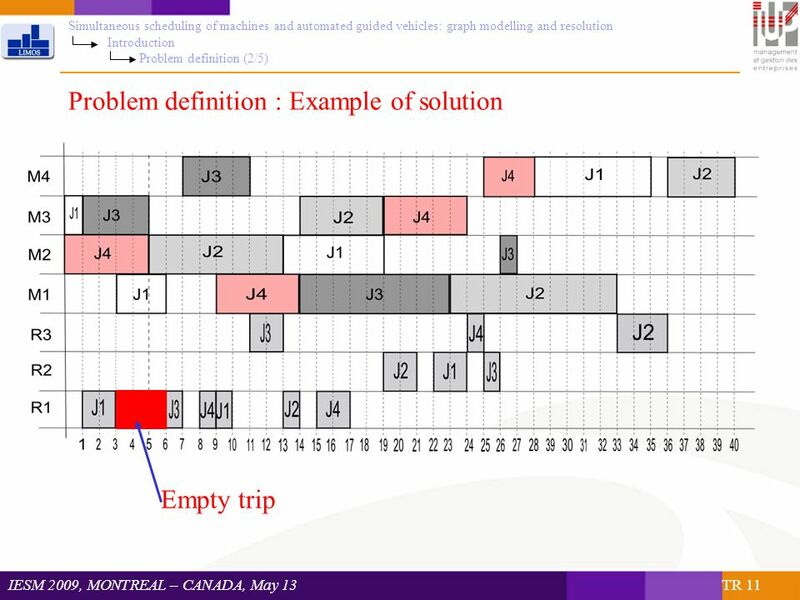 Flow shop Scheduling Problems with Transportation and Capacities Constraints Oulamara, A.; Soukhal, A IEEE SMC Conference Speaker: Chan-Lon Wang. 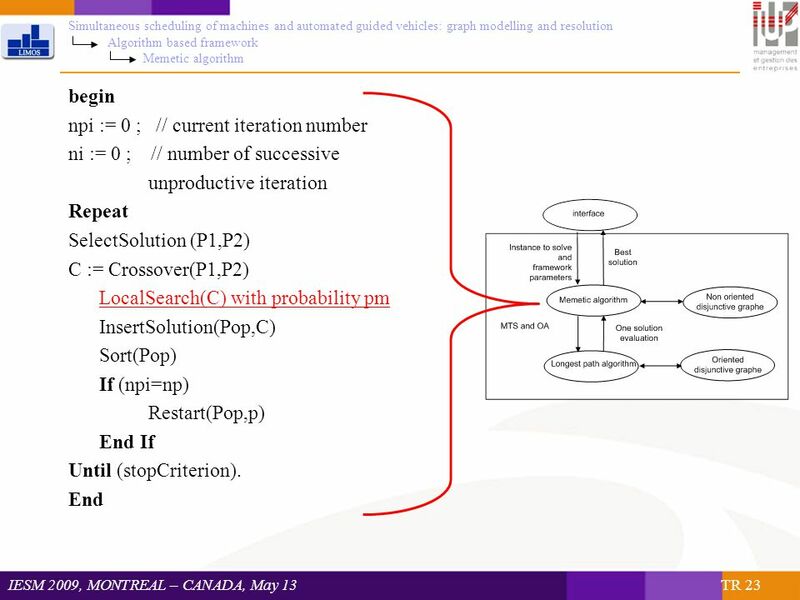 Chapter 2: Model of scheduling problem Components of any model: Decision variables –What we can change to optimize the system, i.e., model output Parameters. 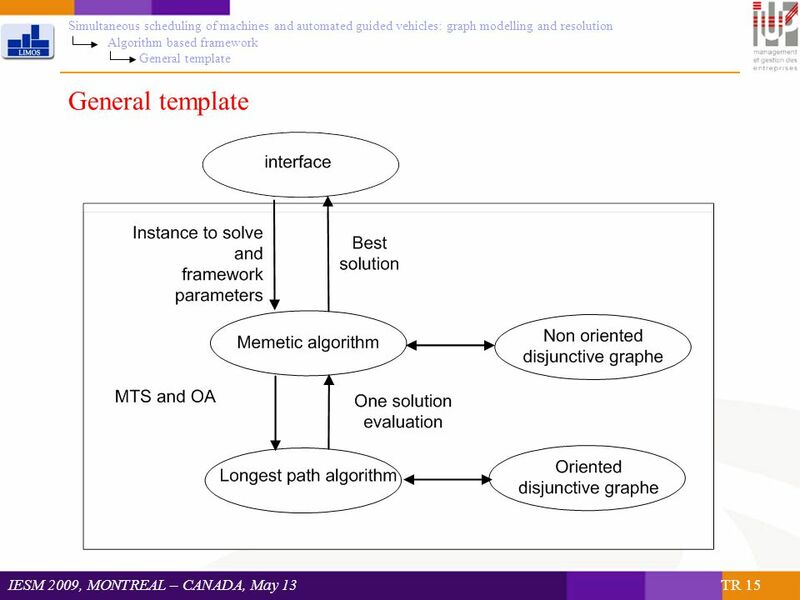 Internet Traffic Engineering by Optimizing OSPF Weights Bernard Fortz (Universit é Libre de Bruxelles) Mikkel Thorup (AT&T Labs-Research) Presented by.